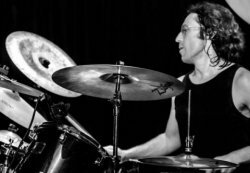 I'm a drummer from South London/Surrey area, I've been playing for over 30 years and have had a lot of experience playing with some of the best bands in the world on some of the biggest stages. Playing drums for such acts as Senser, Moke, Lodestar and the Ozric Tentacles, I've toured with and supported such acts as Rage Against The Machine, Tool, The Black Crowes, Hawkwind, Slayer, Goo Goo Dolls, Moby, and have played main stages at Glastonbury, Reading festival and most major European festivals, as well as playing live on TV in front of millions of people. Over 10 years teaching experience, I have taught at Carshalton College, as well as an after school club for young children and teenagers, private tuition to people of all ages and abilities. I specialise in metal, funk, classic rock, heavy rock, hip hop, soul and fusion, but love all sorts of music. One of my specialities is playing live to click tracks and sequencers, something I do with my band Senser , who are considered to be pioneers of Metal/hip hop/ dance crossover music for the last 25 years. I love playing drums, and look forward to sharing this passion with other drummers. I have a CRB check, and a fully equipped soundproof studio with drum kits, percussion, p.a and recording equipment in Whyteleafe or I can travel to your home too.